Published: Feb. 22, 2013 at 08:37 a.m. 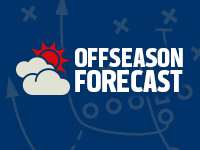 Updated: Feb. 22, 2013 at 10:47 a.m.
With the offseason officially under way, Around The League will examine what's next for all 32 teams. The series continues with the New Orleans Saints. The Saints are seeking stability in leadership after a lost season from the bounty scandal fallout. The most important change is the reinstatement of head coach Sean Payton, armed with a five-year contract similar to the one signed by general manager Mickey Loomis. Former Dallas Cowboys defensive coordinator Rob Ryan will bring his 3-4 scheme to the Big Easy after Steve Spagnuolo was fired for overseeing a defense that allowed the most yards in NFL history. » LT Jermon Bushrod: Loomis has identified retaining Bushrod as his top challenge this offseason. At age 28, Bushrod will be seeking his last big contract after settling for a reasonable two-year deal in 2011. Loomis could have competition from a team such as the Chicago Bears if Bushrod is allowed to test the market. » DT Sedrick Ellis: It's time for a change of scenery. The No. 7 overall pick in 2008 finished with just 36 tackles and no sacks last season while the Saints ranked dead last against the run. Ellis is a poor scheme fit in Ryan's 3-4 defense. » WR Devery Henderson: Henderson has never played for a team outside of Louisiana. That might change in 2013, as Henderson lost a step and showed inconsistent hands while posting his worst season since 2005. 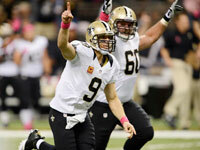 The New Orleans Saints didn't make the playoffs but their season was action-packed, take a look at some of the best photos from the 2012 season. The biggest needs are on the defensive side of the ball, as one might expect an overhaul after setting an NFL record for futility. The cupboard is bare on pass rushers for Ryan's 3-4 defense. Other defensive holes include a run-stuffing nose tackle and depth at cornerback. Re-signing or replacing Bushrod will be the priority on offense. Veteran defenders Will Smith and Jonathan Vilma have been asked to take major pay cuts. Expect them to be released if they don't comply. The Saints can then use early-round draft picks and the second wave of free agency to find players better suited to Ryan's defense. Flush with running-back depth, the Saints could look to trade restricted free agent Chris Ivory or perhaps even release Pierre Thomas in a salary-cap move. Freeing up cap space should allow the Saints to keep Bushrod from reaching the open market.